Radar Training International packages its training programs in a variety of customized options according to the needs and equipment of the attending group. 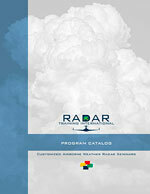 All of our seminars review radar basics and introduce advanced radar concepts. We deliver up-to-date information about current radar systems and their features, and can address the specific interests of manufacturers, safety organizations, and individuals. RTI provides everything but the facility and projection screen. Exceptions are explained in the program descriptions below. Refreshments and/or meals are at the discretion and expense of the hosting organization. Click on a program name for a general description. For full details on course content, view or download RTI’s Program Catalog (PDF). The foundation of the training. Domestic and International. Duration: 6 hours, with brief breaks each hour. This comprehensive seminar is designed for highly motivated professional pilots or flight departments seeking a strong foundation of knowledge, advanced skill, and confidence in their radar systems. From this foundation, our clients can achieve a high degree of proficiency. And as a by-product, they obtain knowledge essential for differentiating between features that are operationally useful and those that are mostly marketing fluff. The order and content of each presentation vary slightly according to specific customer equipment and needs. Due to the significant number of variations available from manufacturers for displays and control panel configurations, specific configurations are not normally discussed. For those departments who feel a dedicated program is not practical, RTI will attempt to coordinate with clients hosting a private program to allow an individual pilot into the program as a guest. Guest attendance is on a space-available and case-by-case basis. Also appropriate for representatives of training departments, large organizations, or government agencies. Significant restrictions apply. Your request for attendance under this option is considered a binding agreement to these restrictions. Please read the detailed Individual Guest Attendee section in RTI’s Program Catalog. Hosting clients can and occasionally do reschedule or cancel their programs, sometimes on short notice. Individuals considering this option must be willing to accept this risk and must agree to not hold liable either the hosting client or Radar Training International for any costs associated with rescheduling or canceling. Further, hosting clients reserve the right to close their program to outside guests at any time. Our program is focused primarily on the needs and equipment of the hosting clients. We will address the radar equipment of the Guest Attendee on a time-permitting basis only. Your own transportation to and from the hosting client facility, meals, lodging and any other expenses associated with attending. Typically, the seminar fee is paid directly to Radar Training International Inc. This seminar is similar to the Customized Private Program, except it assumes a wide variety of radar systems equipment used among those in the audience, and therefore, the program is not tailored to any specific radar manufacturer or system. This option is best suited for safety-oriented gatherings such as flying associations, safety standdowns, or businesses (FBOs, for example) who wish to offer their clients a high quality safety-oriented program. Sponsors are responsible for coordinating all logistics including mailing lists and collection of individual fees. Clients choosing this option must provide the facility, including the projection screen and, for large groups, the projector and a lapel microphone. Additionally, refreshments or meals are at the discretion and expense of the hosting organization. Duration: 6 hours, with additional time as needed to expand on topics of interest and to address questions. Specifically for manufacturers wanting a better understanding of the design and operational employment of airborne weather radar from the pilot’s perspective. To provide continuity with the users of their systems, this program includes the same information as the Customized Private Program, but expands in more than fifteen areas of interest to manufacturers, including topics such as human factors, control panel and display nomenclature, marketing considerations, and system features (practical versus impractical). Ultimately, and in the interest of safety, the goal of the manufacturers should to be to provide their customers with the best possible product. Pilot input is essential to the design and manufacturing process, as there are many considerations that, if disregarded, can render a system or feature confusing or useless. Pilot input, however, must be rooted in extensive academic knowledge backed up by a high degree of radar proficiency and global operating experience. Radar Training International will walk pilots, engineers, and marketing personnel through the information they need to consider when designing a new system. As with our Customized Private Program, the client is responsible for providing the facility and any meals or refreshment for their group. RTI monitors trends in aviation safety and technology integration, and speaks to groups about our observations, common pilot errors, and misperceptions regarding system designs. The Public Speaking option, tailored to the hosting group, is most popular with safety-orientated seminar programs where time is limited but a safety-related message must be communicated. It can include any portion of our Customized Private Program, such as Reflectivity. Or, it can cover more broad topics, such as common errors when using airborne weather radar, human factors, or the role that technology plays in augmenting professional skills. Review the Customized Private Program course content if necessary for potential topics of interest. The purpose of this option is to communicate a safety-related message or trend of interest, but does not constitute formal or comprehensive radar training. It is informational in nature and highlights topics appropriate to the client’s specific needs. Practical application of seminar information during active flight for clients who have attended a 6-hour program. Duration: As required to accomplish learning objectives, including time to adequately prebrief, fly, and debrief the sortie. For those who have attended a 6-hour program from RTI, we take the program’s advanced radar concepts into the operational environment. Accompanying pilots, from the jumpseat, on either a dedicated or an actual operational flight, we provide feedback and input based on observations. For professional pilots, this facilitates translation of academic/seminar information into the operational world in a highly efficient manner. Manufacturers find this option particularly useful because it highlights real-world problems, issues, and considerations (including human factors) in realtime—things that if addressed properly, will give them the competitive edge in the industry. The aircraft and the Operating Manual (or installation manual) for your radar system.